It’s safe to say that Modernism was embraced earlier in some places than others. It might be a pointless – even futile – exercise to pinpoint exactly when and where the movement that changed architecture, design and …well practically all facets of human life had its major breakthrough. But an exhibition of radical architecture organized by Deutsche Werkbund that opened in July 1927 and attracted 500,000 visitors in the months to follow might very well have been the occasion when Modernism made an impact with the major public. 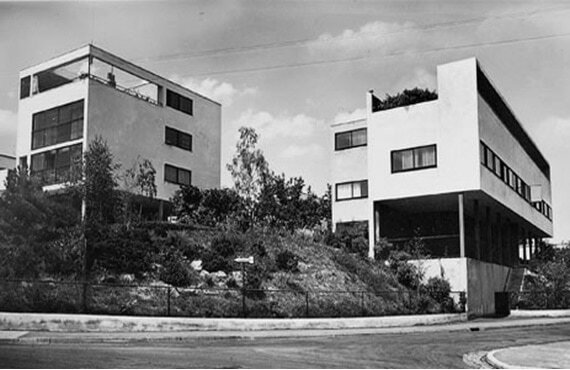 The 33 buildings – all but two white – were designed by the rising stars of the emerging Modernist movement. Under the leadership of Ludwig Mies van der Rohe architects like Le Corbusier, Hans Scharoun, Josef Frank and Hans Poelzig contributed with buildings that featured all the elements that were to become staples of 20th century architecture: facades lacking any form of decoration, flat roofs (that could be used as terraces), window bands and open plan interiors. One name that deserves a special mentioning is Walter Knoll – then as well as now the name of a furniture brand from the Stuttgart area. Founded in 1865 as a ”leather shop” by the early 30’s the company had fully embraced the radical ideals of the Modernist movement making tubular steel chairs with elastic suspension for the back and seat. The company supplied furniture for many of the dwellings of the exhibition. Only eleven of 33 houses open to the public during the 1927 exhibition have survived. ​And as for Walter Knoll the success story has continued. Today a premium furniture brand that collaborate with some the leading architects that shape our world, like Norman Foster, Ben van Berkel and Meinhard von Gerkan. Weissenhofmuseum is open 10 am to 6 pm on Saturdays and Sundays, 11 am to 6 pm Tuesday to Friday. Mondays closed.